From a small gathering of 13 balloons in 1972, the Albuquerque International Balloon Fiesta has grown to become hands-down the largest balloon event in the world. Held each year during the first week in October, the Balloon Fiesta brings over 700 balloons, over 1,000 pilots and tens of thousands of spectators. Over 1000 balloons participated in the 2000 fiesta. The first “fiesta” was launched from the parking lot of Coronado Center in uptown Albuquerque. The following year it was held at the New Mexico State Fairgrounds. 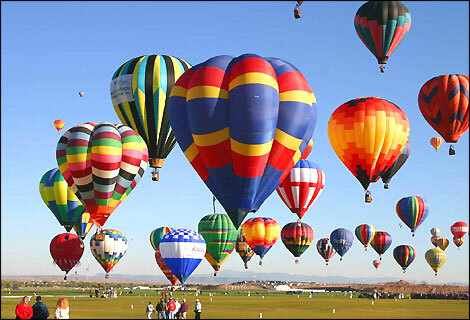 By 1978 Albuquerque was playing host to the world's largest ballooning event (273 entries that year alone). 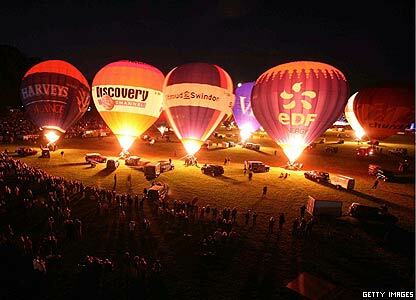 Today the Balloon Fiesta includes such special events as the weekend and Wednesday mass ascensions, Balloon Glow, Night Magic Glow, and the Special Shape Rodeo and Special Shape GlowdeoTM where more than 100 uniquely shaped balloons participate. The Balloon Fiesta is unusual among large events, with the spectators mingling right on the launch field with the pilots and chase crews. If you visit Albuquerque during the Balloon Fiesta, a balloon ride is a must. This is definitely a sport that encourages spectator participation But watch out for balloons taking off and landing. It’s a little like herding cats when a hot air balloon lifts off. They go with the breeze, pilots navigating by ascending or descending into winds headed in a different direction. The “Albuquerque Box,” often lets balloonists take off and land right back at the Balloon Fiesta Park. Prevailing lower winds blow south for takeoff, with northern moving winds a few hundred feet up, creating the “Box.” Make your reservations far in advance, some visitors reserve their accommodations for next year as they check out. 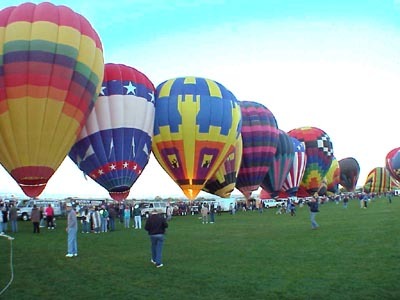 Many of the hotels and motels offer shuttle service to the Balloon Fiesta Park and there are facilities for RVs right at the Park. The City of Albuquerque provides a “Park and Ride” service from convenient locations around Albuquerque. 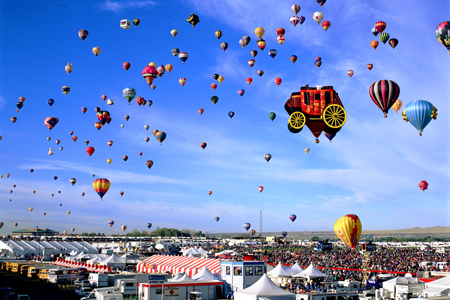 There is parking at the Balloon Fiesta Park, but the Mass Ascensions on the weekends can draw up to 100,000 spectators. For additional information on the Albuquerque International Balloon Fiesta, please click below!